The official 2017 mile-by-mile route narration of the rail line from Skagway, Alaska, to Carcross, Yukon, enhanced by over 40 photos, and links to more information. A list of 80 points of interest on the entire 111-mile rail line from Skagway, Alaska, to Whitehorse, Yukon. Carcross to Bennett on the WP&YR "Washout Special"
Due to a major washout south of Bennett in May 2009, 2 passenger cars were trucked from Skagway to Carcross and the "Washout Special" was initiated. Commentary and 20 photos from the inaugural run on May 25, 2007. Discovered in 2003, this 16mm film takes us from Skagway to Dawson by train and sternwheeler. This article shows captioned 60 stills from the film. 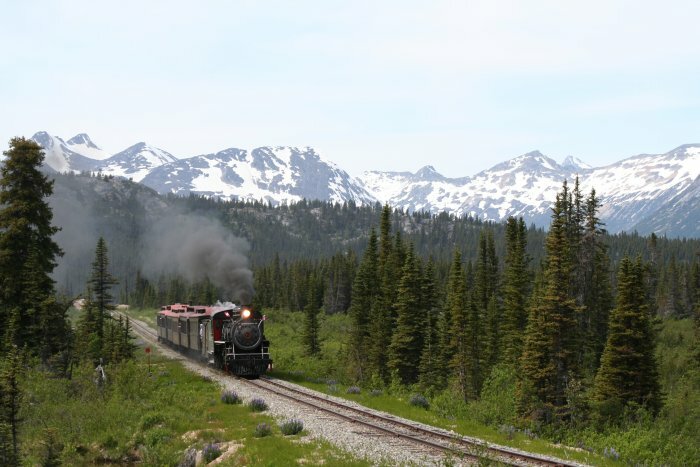 For steam train fans, the Skagway-Bennett excursion is the ultimate trip in the North. This photo album from July 2001 by Murray Lundberg will show you why. Almost 40 photos from 1997-2003, recording major points and/or Mileposts. Seventeen photos from 1997-2003, recording major points and/or Mileposts. Steve Barry has posted about 20 large photos from his WP&YR trip on June 19, 2001.